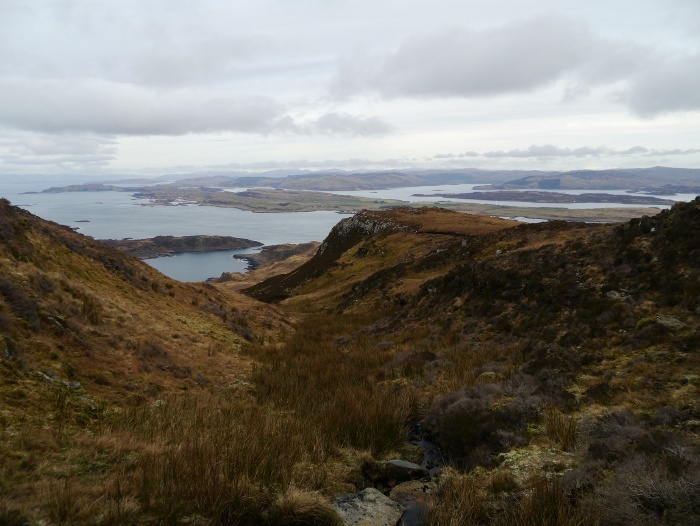 Last week I got an email from John Manning confirming that my TGO Challenge route has been given the OK by my vetters. 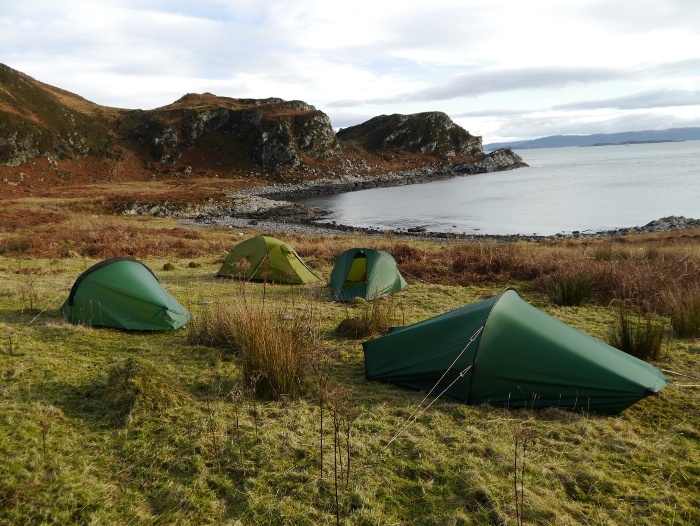 I had to add some clarification to my original submission due to a duff grid reference for a wild camp. Apart from that I got positive feedback from Issy and Les, thanks for your input guys. With the route sorted out I am now really looking forward to my second crossing. The train journey to Mallaig has been booked (my first time on the Caledonian sleeper) and I have secured a couple of b&b’s in strategic places along the route. Some time prior to setting off I will outline the route in more detail and describe the planning process. Anyway, there will now be radio silence for the next two or three weeks. My wife and I are jetting off to Thailand on our honeymoon on Thursday, after our marriage yesterday. A lovely memorable day. 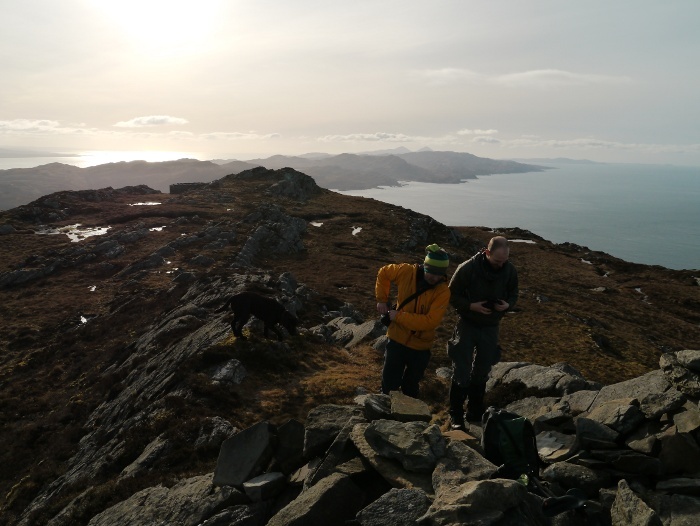 The day was too good to waste, so with daysacks packed we left the bothy and set off up the hill. 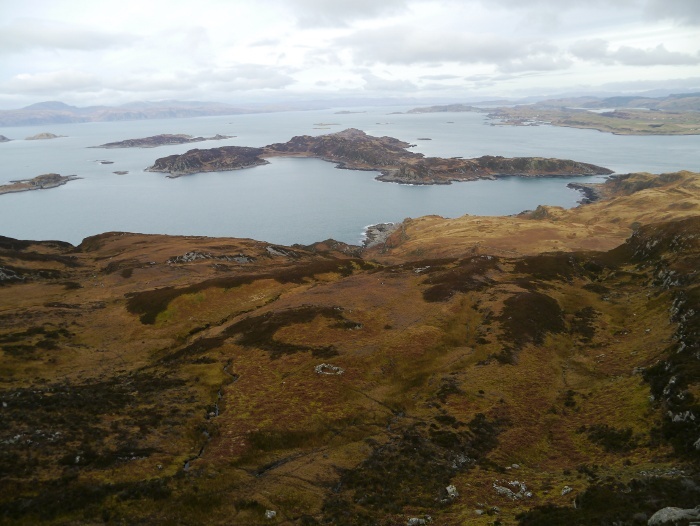 Our destination was Cruach Scarba, the highest point on the island at 449 metres. 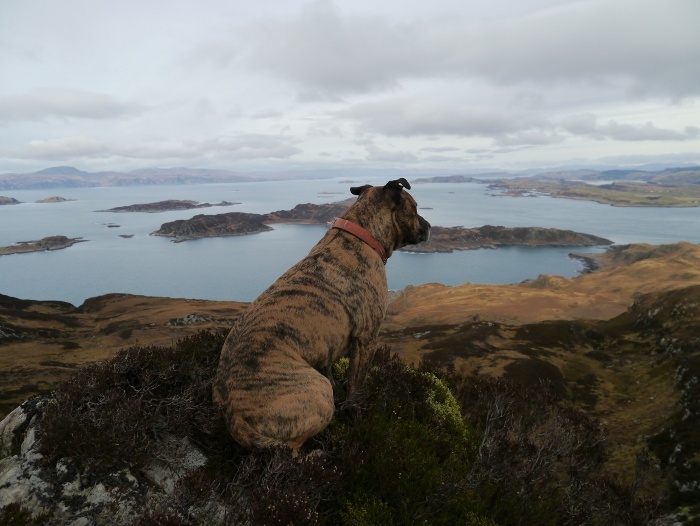 Pete had previously visited the island and climbed the hill. Therefore I was more than happy to leave my map in my rucksack and follow him in his bright yellow jacket. The first mile or so was rough and trackless, involving the usual effort of getting some decent height when starting from sea level. There were plenty of opportunities to stop and look at the stunning vista that was slowly unfolding. The dogs however ignored the view, keeping an eye out for any furry four legged critters escaping up the hillside. If you want to clear every deer and goat within a square mile just take a couple of dogs. 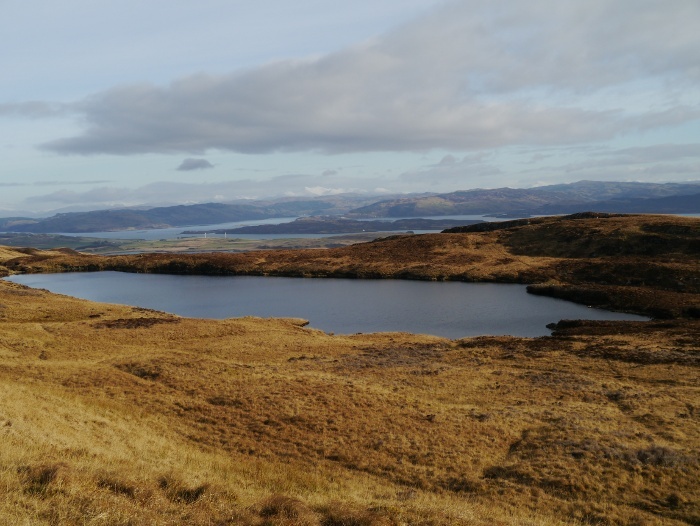 Our first landmark was Loch Airigh a’ Chruidh where Pete delivered us accurately to the northern end. As water was abundant on the island and pretty much guaranteed to be clean, we had not brought water bottles but empty mugs with us for the walk. A dip into the stream flowing into the loch produced mugs full of cold and clear water. So cold it induced ice cream headaches. 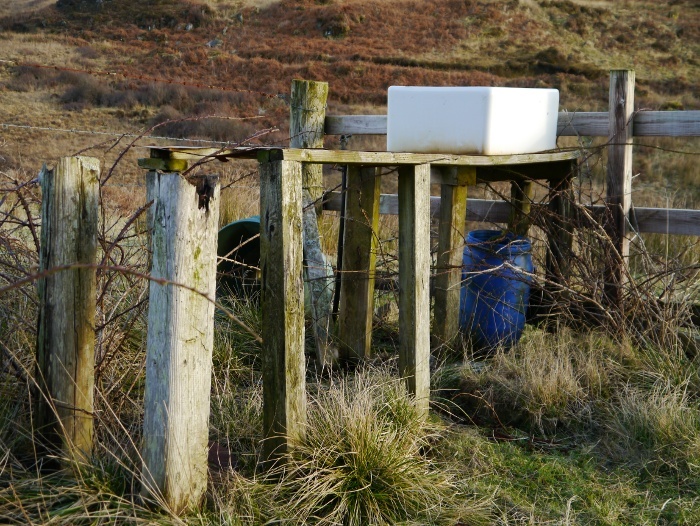 At the edge of the loch we picked up a well constructed pony path that crosses the island from Kilmory lodge, before contouring high above the south coast. This speeded up progress considerably. The eastern horizon kept demanding our attention, with a large wall of snowy mountains on the horizon. One particularly large snowy pyramid stood head and shoulders above them all, Ben Cruachan was our best guesstimate. A cairn marked the change in direction and we left the path to descend a little way to a viewpoint that Pete had mentioned. 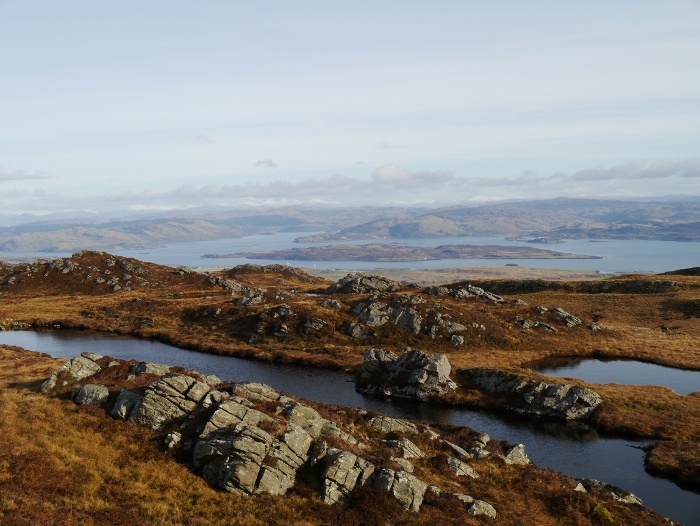 The landscape to the south from the small rocky outcrop was simply breathtaking. From our high perch the west coast of Jura was spread out in front of us, line after line of what looked like crouching prehistoric lizards with their tails in the sea. In the far distance two perfect pyramids rose above the low rugged ridges. 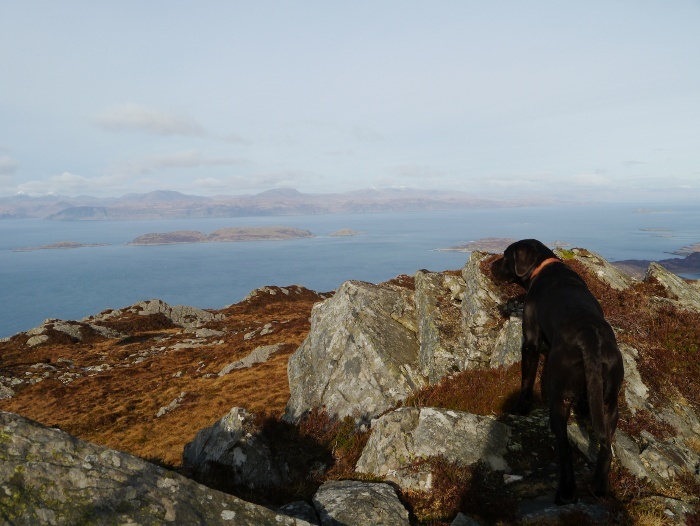 It would have been a splendid day on the Paps of Jura. 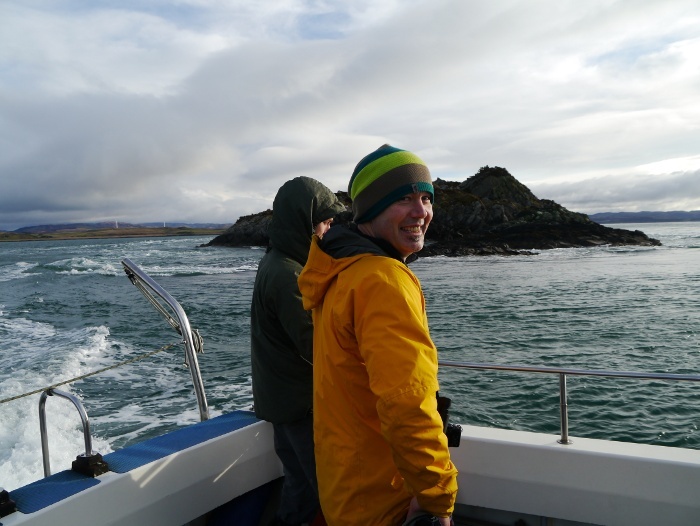 The famous Corryvreckan lay at our feet, unfortunately it was the wrong time for the whirlpool to be in action. However even from this height the swirling eddies and racing water was clear to see. We stood as a group for a while drinking it all in, sharing the binoculars to pick out points of interest. The path continued on level ground, becoming less distinct in places. The rough boggy vegetation was slowly winning the battle and swallowing it up. At a point where it starts descending we left it for a pathless bash up steep rough slopes. With height the going got easier as the vegetation got shorter. 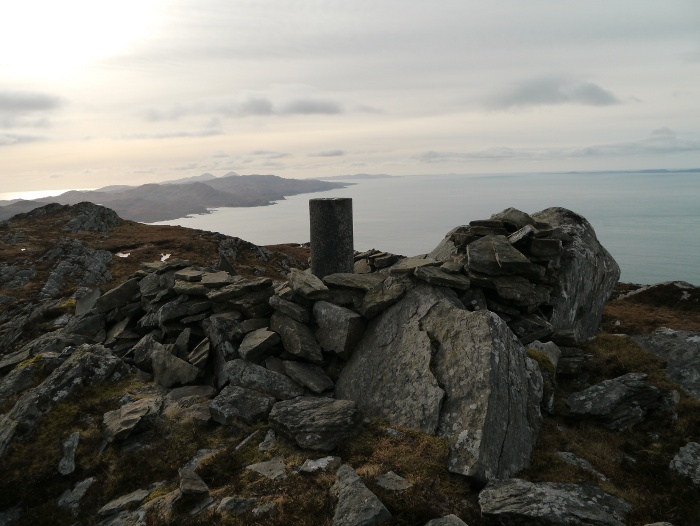 The trig point was finally reached and oh boy what a view. 449 metres is hardly the Himalaya but on a small island the height is greatly exaggerated. 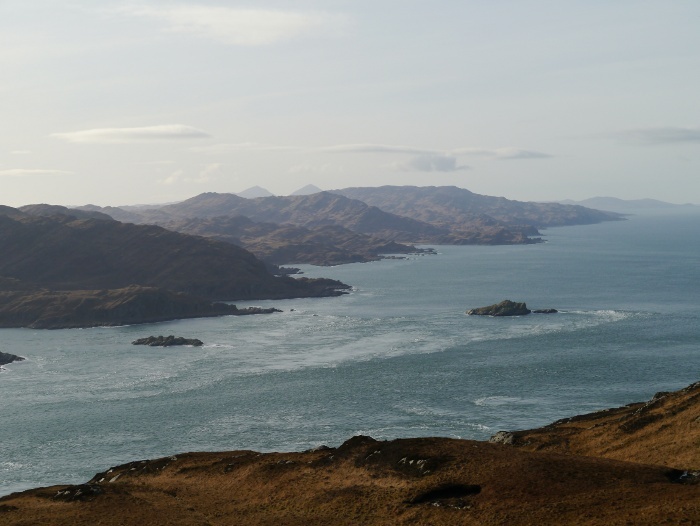 It is views like these that make the Hebrides so special. To the north west the Island of Mull dominated the view, its huge sea cliffs visible. Nearer at hand were the Garvellachs which look like they may be worth a charter boat to spend the night on. To the north and east was a huge vista of mountains, the peaks of the Western Highlands covered in snow. Unfortunately a haze in the air meant that it was impossible to capture on camera what we could see. A rocky outcrop provided shelter from the cold wind, a perch to gaze from and feast our eyes. All of a sudden someone spotted something in the air. First one Golden Eagle, then two, then three! Finally to top it all off a White Tailed Eagle decided to do a fly by, followed in quick succession by a Hen Harrier. Top that Bill Oddie! The group then split into two. Rich and Pete decided to descend to and explore the rugged west coast. 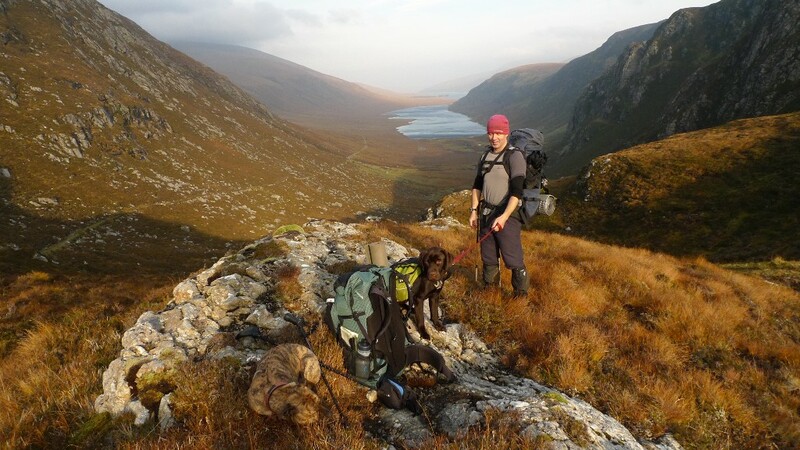 Myself and Rob decided that we would take things easy and head north to pick up the track back to the bothy. The dogs were divided up between us. The going started off easily along the spine of the island, sticking to the high ground before descending along a prominent ridge line. The islands to the north began to fill the horizon as we lost height. 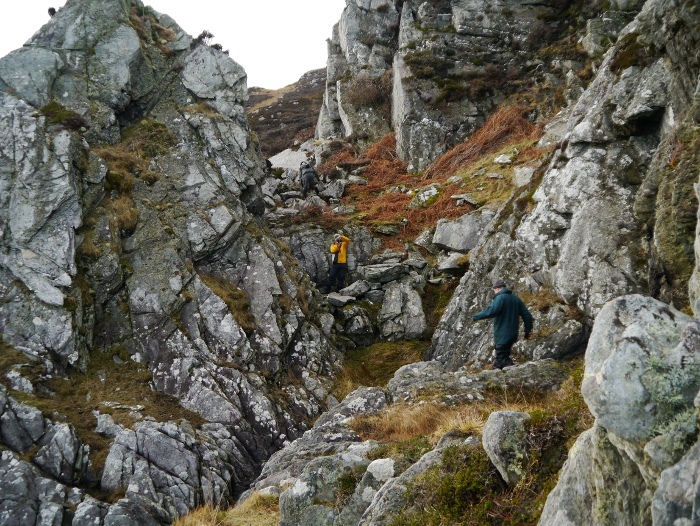 We picked one rocky spur and found that it ended in a significant cliff, the ground dropping away into a natural amphitheatre. 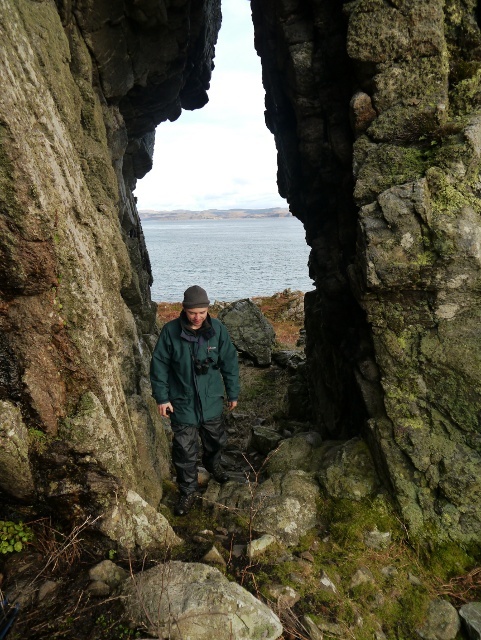 A good position to view the serpentine shape of Lunga. A bit of backtracking and we set our sights on the whitewashed building of Kilmory Lodge. 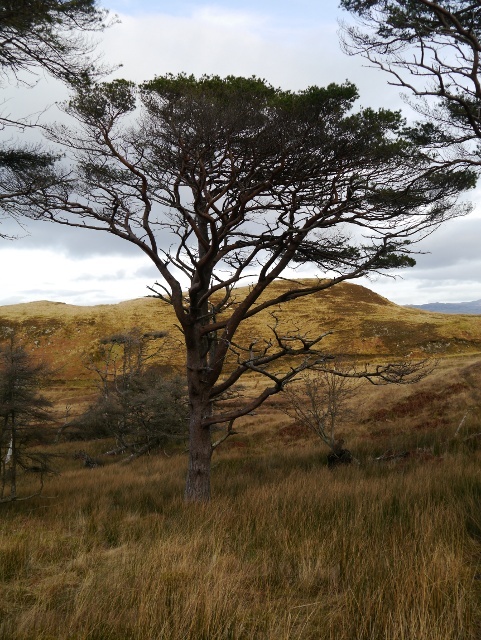 A shallow boggy glen was crossed filled with the skeletons of Scotts Pine. A sad sight but thankfully there were a few specimens still alive. 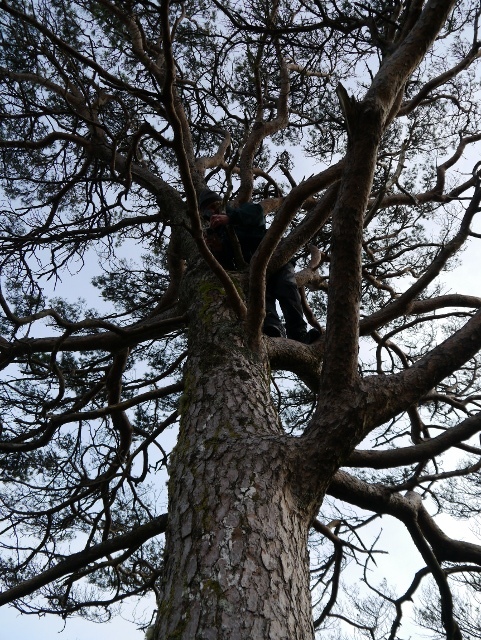 Rob being a big tree fan decided that the best way of appreciating them was to climb to the top of the largest. Reuben was unimpressed and wondered what was holding up his walk. 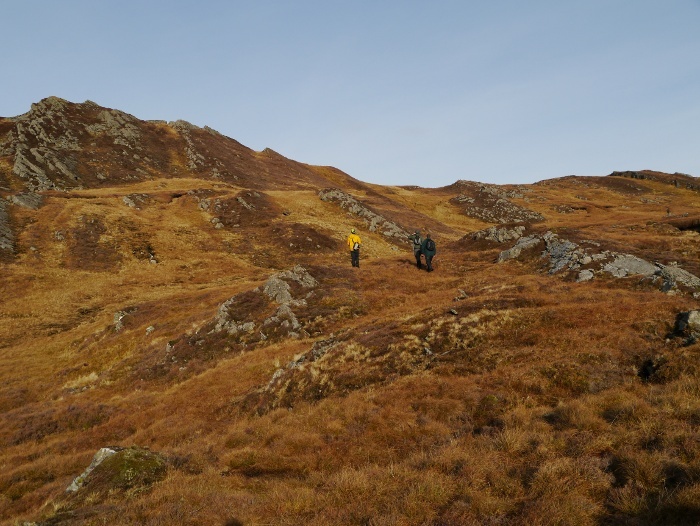 Once on the track it was an easy stroll back to the bothy, much quicker than our original journey as we were unencumbered with heavy sacks. 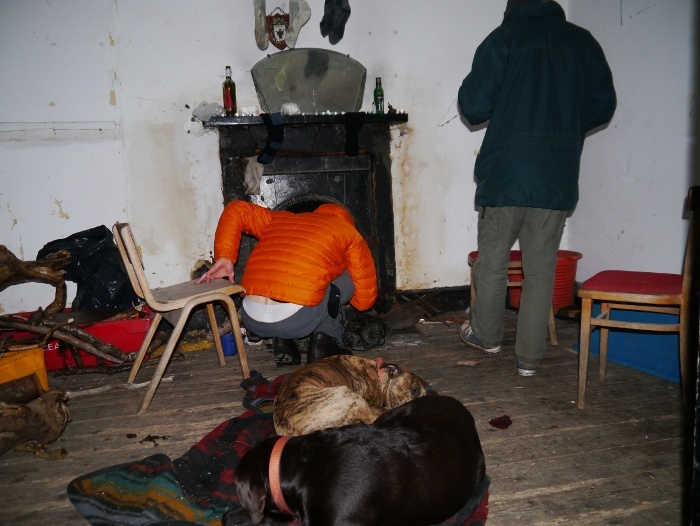 Already after one night, coming back to the bothy felt like returning home, the place was beginning to feel familiar. 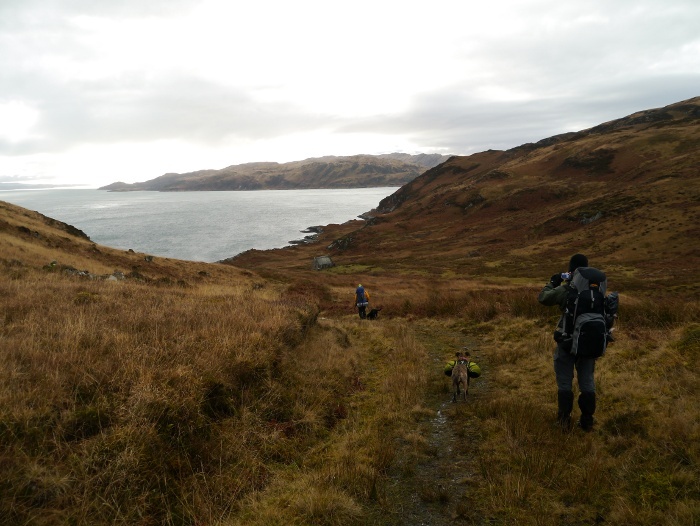 Pete, Rich and Dougal had not yet returned so after a cup of coffee we decided to explore the headland to the east of the bothy. Rob went ahead whilst I had a bit more of a sit down. On the way down to the beach I found Reuben standing and staring at something white and fluffy. It turned out to be a sheep that had got caught in a bramble bush, the thorny stems tightly wound round its woollen fleece. It was impossible to set free by hand so I fetched a saw, it eventually legged it after I hacked off a bit of its wool. Hopefully by coming nose to nose with a woolly has demystified them a bit for Reuben. I finally got to set off round the bay after Rob. Whilst sitting at the headland I did a stupid thing. I decided that I would take a photo of Rob sitting on the rocks. Whilst framing the photo I stepped back without looking and put my foot in a deep bog up to my knees. In my haste to get out I managed to put the other boot in too. My freshly waxed boots that had remained dry after tramping through bogs all day were now full of water. The only positive that came out of this was whilst taking my socks off to wring them out I spotted a tick that had burrowed into my leg. Even in February the little critters don’t give up! Back at the bothy there still was no sign of the others and the light was quickly fading. Reuben as usual laid claim to the manky blanket that someone had left. 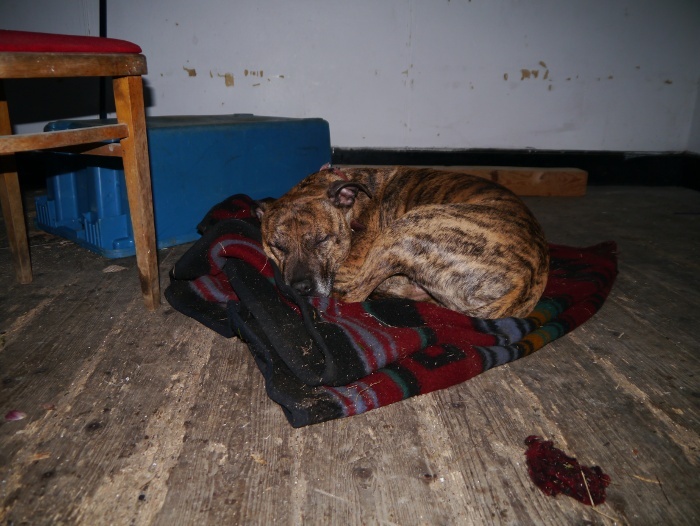 After another energetic day on the hills he was soon snoring away. We made hot drinks and quickly had a fire roaring, darkness finally falling over the island. Once 6.00pm had come and gone I started to worry a bit about the others not returning. I had a feeling that they had set off without torches, if that was the case then the journey along the coast was going to be tricky in the dark. I began to wonder what was the ideal time to call out Mountain rescue if they did not return. In the end I settled on waiting until dawn, not much anyone could have done considering we were unsure of their route. Thankfully this was all academic as shortly before 7.00pm they finally arrived. 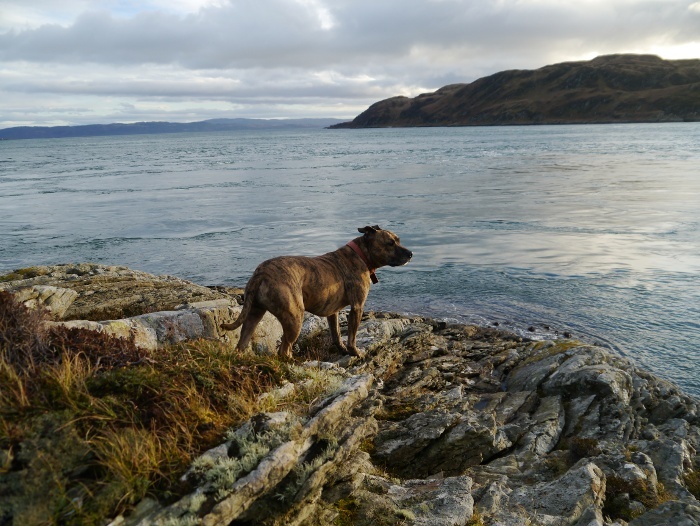 The west coast had been much harder than anticipated with some tricky scrambling with a dog. It sounded like the final hour or so in the darkness had been tough going. Maybe take a torch next time lads?! 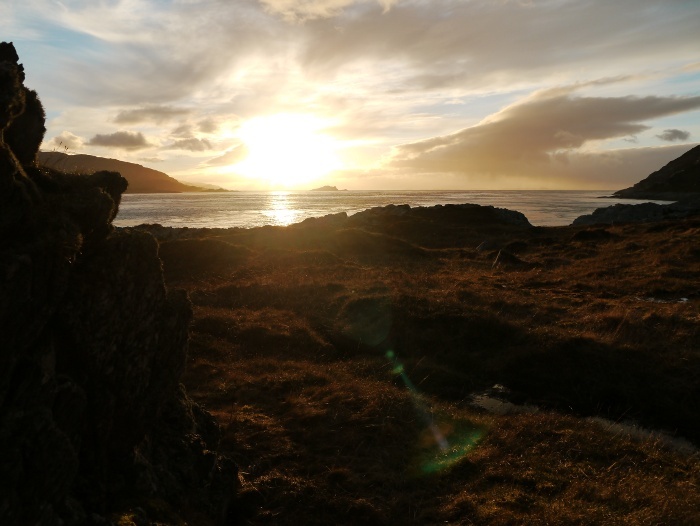 Whilst walking along the coast, Pete had received a call from Duncan saying that bad weather was scheduled to hit the following evening and last throughout Monday. He had sailed past our campsite earlier that afternoon and did not fancy the chances of our tents remaining there! He still felt that he would be able to pick us up as planned, so Pete had said that we were happy to stay. Excellent, as I felt that I was just settling into island life. By the second night we had properly sussed out the makeshift stove. This effectively is an old gas bottle shoved sideways into the fireplace, with a door cut into the end. A good effective effort by someone. Once more we sat round the fire drinking rum laced coffee and putting the world to rights. Being a Saturday I think we even managed to stay up past 9.00pm. The island was wearing a more familiar cloak the following morning, the weather had definitely become more Hebridean. It was a day where no one had any real plans. 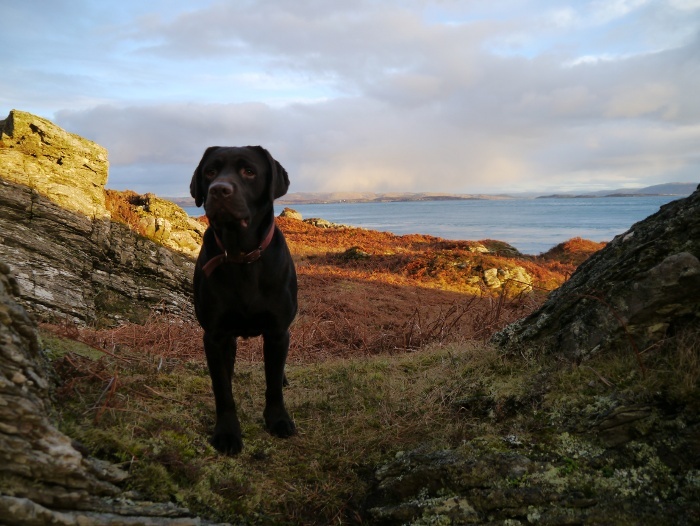 Pete being an earlier riser was out the door before I had finished breakfast for a stroll up the east coast with Dougal. I set off an hour later along the same route with Reuben; Rob and Rich planning to catch me up. It was a day of low cloud and drizzly rain, perfect for spending at low level with the sea and my thoughts for company. 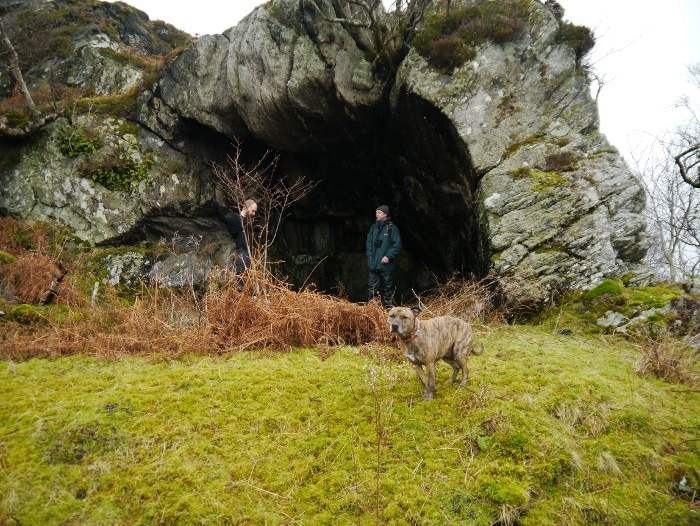 I could spot Rob and Rich in the distance so found a rather nice cave to shelter in for a while. This had someones no longer secret stash of firewood in it, a couple of bags of neatly chopped logs next to a fire pit. I would imagine they had been left by sea kayakers. 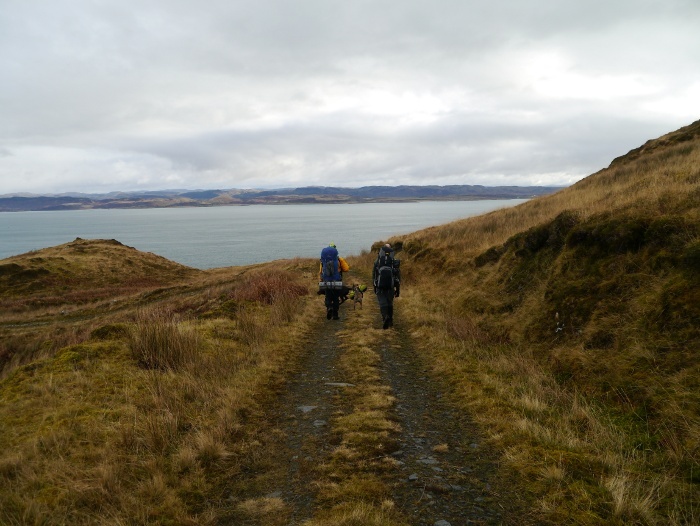 Rob decided to peel off and return over the hills back to the bothy, whilst Rich and I continued along the coast. Less than ten minutes after Rob had departed we spotted movement in the water. Binoculars revealed three otters, another nature bonus. The east coast lacks the ruggedness of the west and south of the island but it more than makes up for it in bogginess. Walking through the sheltered woodlands I was glad that it was winter, I could easily imagine all the vegetation being of tropical rainforest proportions. Dark damp and humid the midges and ticks would be unimaginable in their full horror in mid-summer. I managed to walk within a metre of the best find of the whole weekend. 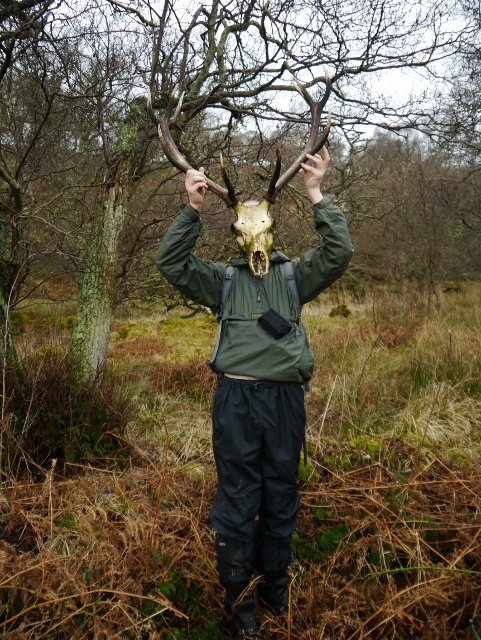 Rich who was behind stumbled across a huge red deer stag head complete with a set of ten point antlers. A really fine specimen that made me immediately feel rather jealous. People pay good money to mount such objects on their wall. On a positive note I was not the one who had to lug the deceased beast across the island for a couple more hours. The woods were increasingly rough going until we finally stumbled upon the moss-covered ruin of an old chapel and a few gravestones. A very atmospheric setting where you almost expect the cast of the hobbit to emerge from behind a tree. 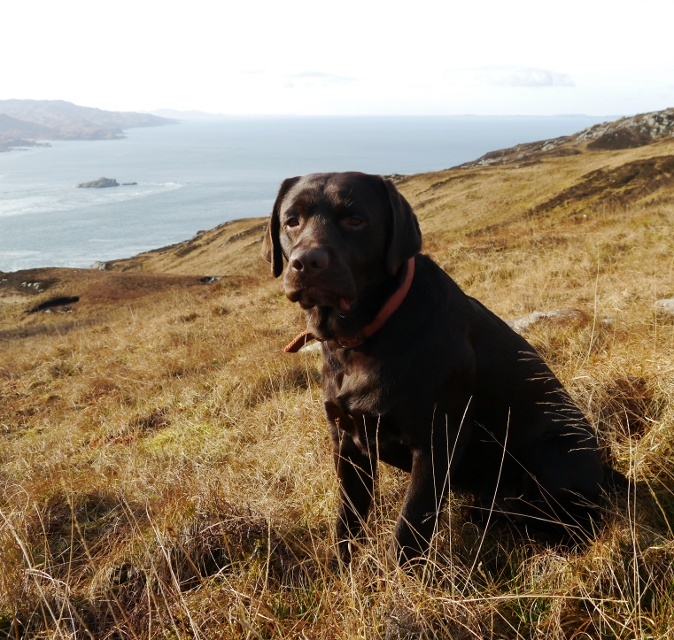 Later back at the bothy we found that Pete had dragged a very reluctant big brown labrador for another excursion along the south coast. Those in the bothy got another fire going and set about the important business of a late lunch. 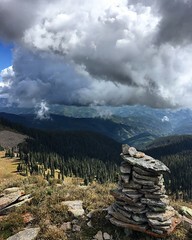 I was aware that the weather would be coming in later that evening and considered taking my tent down and sleeping in one of the upstairs rooms. Another exploration of those dusty and decidedly spooky rooms made me decide a wind battered tent would be the preferable option. The last of the rum was finished during the evening as the wind slowly picked up outside. The front door missing a panel of glass meant that the hallway was a bit of a wind tunnel, a big contrast with the room with the fire. The rain soon joined in with the wind, drumming on the windows and soaking anyone going out to use the non-existent facilities. With tiredness overtaking us all it was hard to drag ourselves away from a warm fire and into the teeth of a howling gale. 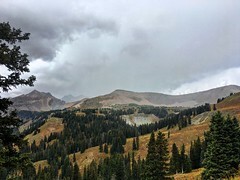 It turned out that we were in a fairly sheltered spot as laying in my tent I could hear the weather rage all around but the tent would remain static. Every now and then a violent gust would grab the tent and give it a good shaking, each time waking me. The heavy rain outside sounded like my tent was being pebble dashed. The seams on my outer need looking at as a few drips managed to get onto the inner. It was a tempestuous morning, the sea looking angry under a bruised sky. Patches of brilliant blue would quickly be replaced by angry black clouds throwing a mixture of rain, sleet, hail and snow. Tents were wrestled to the ground in an attempt to stuff them back into bags. 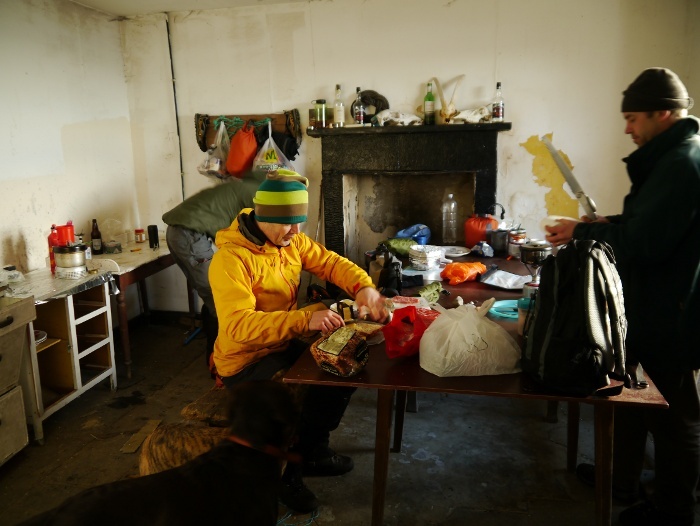 The bothy provided welcome shelter whilst we waited for 12.30 for the walk back to the jetty to meet Duncan. 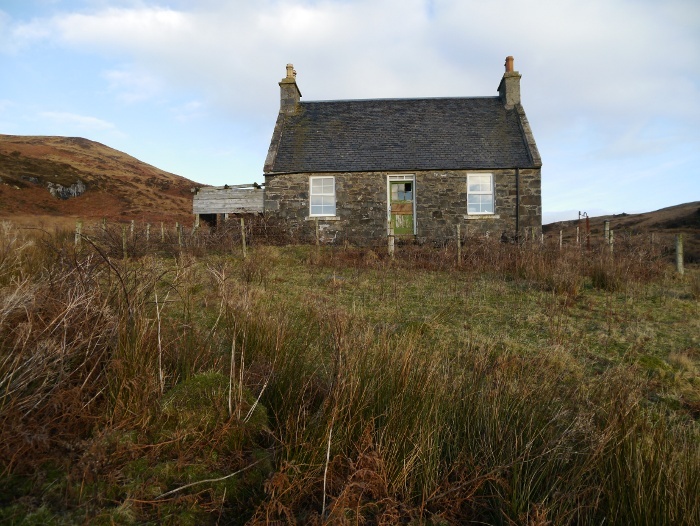 The bothy was swept, wood sawn and rucksacks packed. I had managed a final photo before the tents were taken down. What a spot. We must have had the wind in our sails as we managed the walk back to Kilmory lodge in thirty minutes, half the time taken on the way out. We used the substantial walls as shelter from the wind as we waited for Duncan’s boat to appear. Earlier than expected we spotted him coming around Luing, bouncing along on the choppy sea. We set off down the hill, timing our arrival perfectly with his. It turned out that he nearly did not make it, having got caught up in a lobster pot. 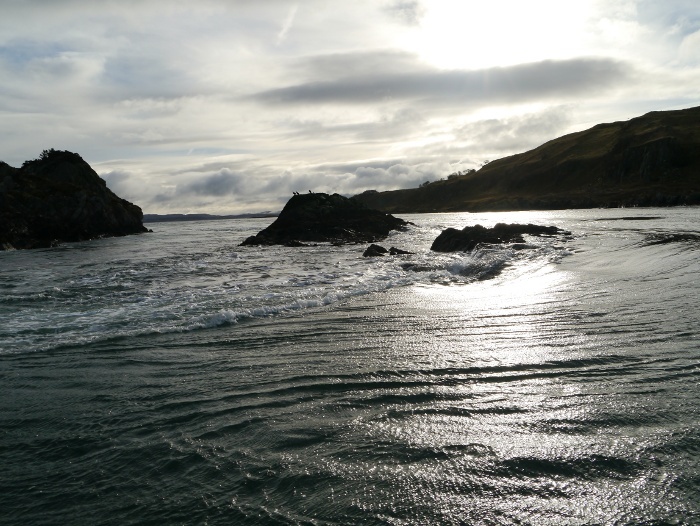 The journey back was smoother than expected, the wind and waves at our back. There was one hairy moment when a wall of white eventually overtook us, enveloping the boat in a violent gusty hail storm. We all dived for cover, Duncan being less than pleased that we filled his cabin and instruments with ice. As we disembarked Rob asked Duncan if he was going out again that day. No I’m bloody not was his answer. 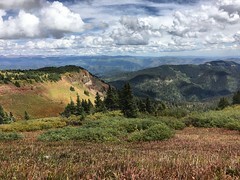 In october 2011 I had the privilege of backpacking in a vast open area called the Ben Armine Forest. 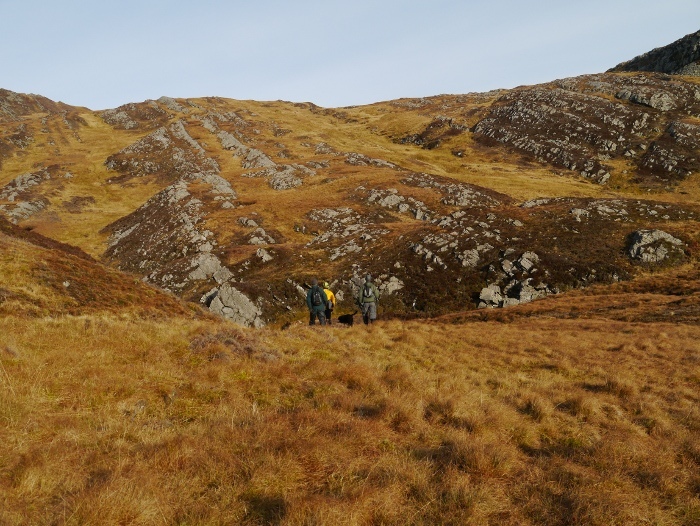 This is situated just south of the Munro Ben Klibreck. From the summit of the 705 metre Ben Armine the view revealed just how huge the surrounding landscape is. In some respects it was rather overwhelming, hard for my brain to comprehend that there are such empty places in the UK. Man made intrusions into the landscape were non-existent. It really is not a place to visit if you suffer from agoraphobia. 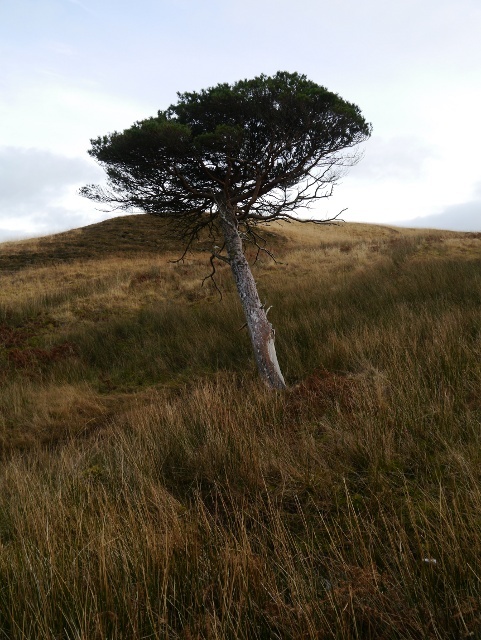 The fact that it is one of those rare hills that is difficult to visit on a day walk added to the true sense of remoteness. 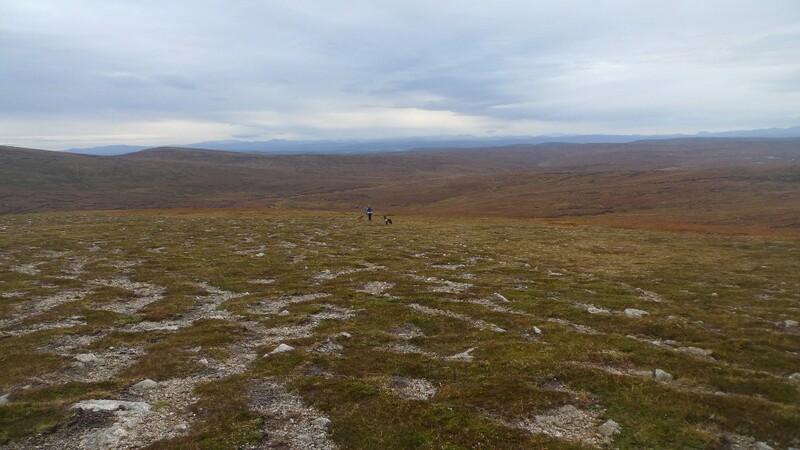 Below is a photo of Pete descending towards an estate bothy with expansive views to the south west. 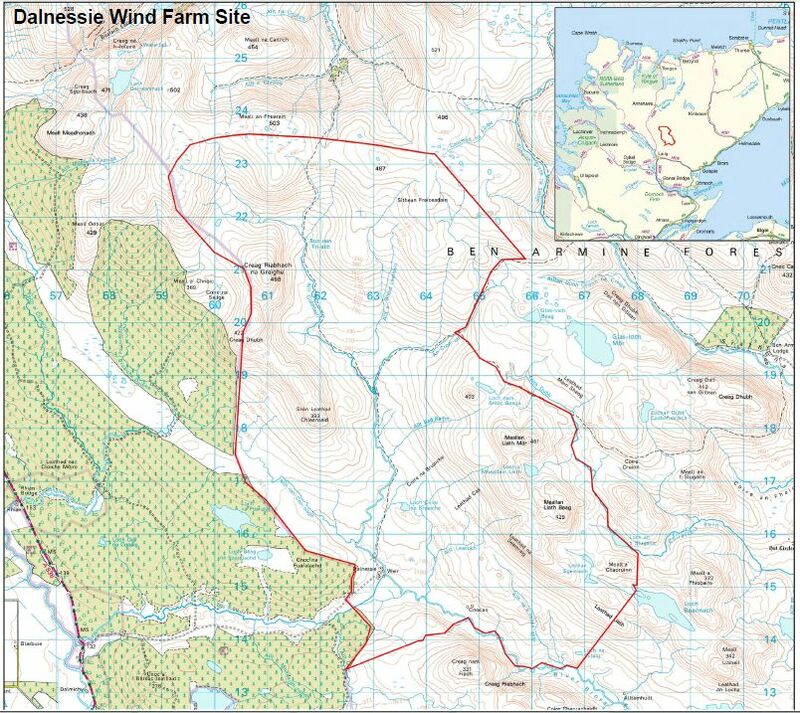 I have to say that I had a total feeling of disbelief when I discovered that SSE had submitted plans to build 27 huge wind turbines in the middle of it all. It really did beggar belief. The view above would become dominated by giant turbines and miles of access roads. Walking out on the third day of the backpack we crossed the Bealach Easach with its absolutely beautiful view down the length of Loch Choire. A splendidly uplifting moment in the autumn sunshine. The boundary of the wind farm is two kilometres from this spot. Situated on high moorland the turbines will be visible for miles around in this open landscape. It’s a bit of a fecking joke that SSE are the sponsors of the Highlands and Islands Tourism Awards. * Just to make it clear that I am not anti wind energy. I believe that in the right places wind can contribute to the energy mix. However I do fear that there is far too much emphasis in on shore wind to meet renewable targets. This means that the wildest and most valuable parts of the UK landscape are being trashed by greedy developers trying to cash in on subsidies paid by me and you. 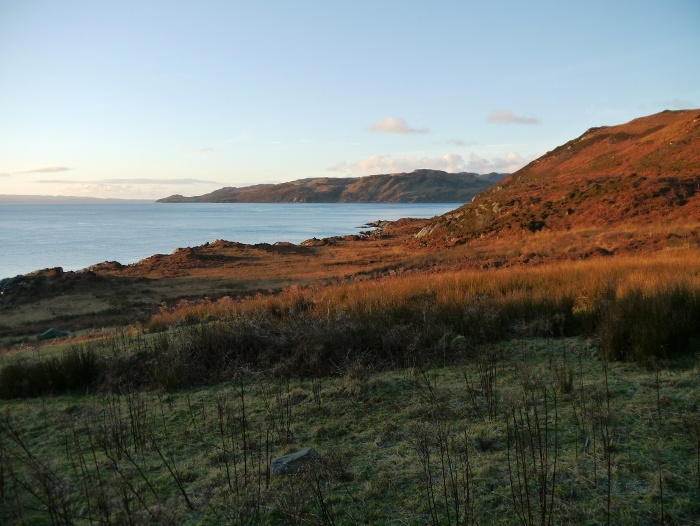 An example of wind energy working well is on the island of Eigg. Small scale and to benefit the local community. The stag weekend got off to a fine start with a curry lunch at Nottingham’s Indian community centre. A thali dish filled with curry, daal, rice, salad, chapati and desert all for £3.70. An essential lunch time treat. The Bongo was loaded with a mountain of gear alongside Rob, Rich and Reuben for the long trundle north to Glasgow. The destination was chez Peter Edwards where the journey was broken up for some fine hospitality and fish pie. Early the following morning the Bongo was full to bursting point with even more gear, four blokes and two dogs. Reuben being joined by his close buddy Dougal the giant chocolate labrador. We made a quick exit out of the city against the grain of the rush hour traffic. Good time was made on the quiet roads, finally parking at the marina of Craobh Haven two and a half hours later. 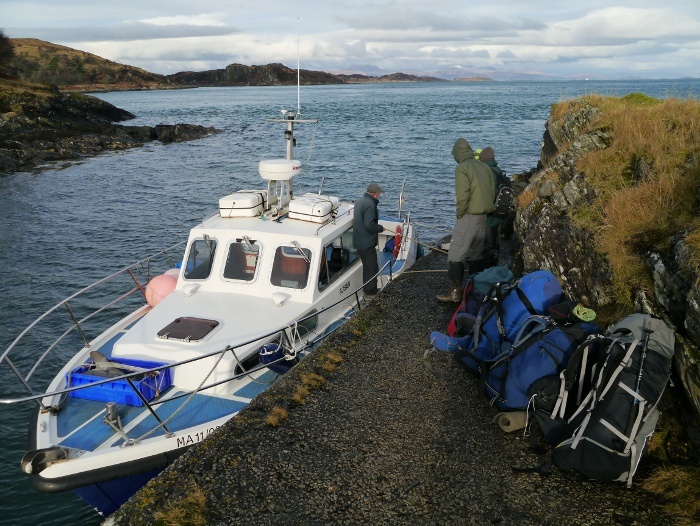 For the previous week I had been nervously watching the weather forecast as gales swept across the country, hoping that the boat would get us across to the island. A final heavy squally shower passed just as we parked, leaving us entering the marina under clear skies and light winds. It was the first time that I had been on a charter boat and I have to say that I was rather excited. 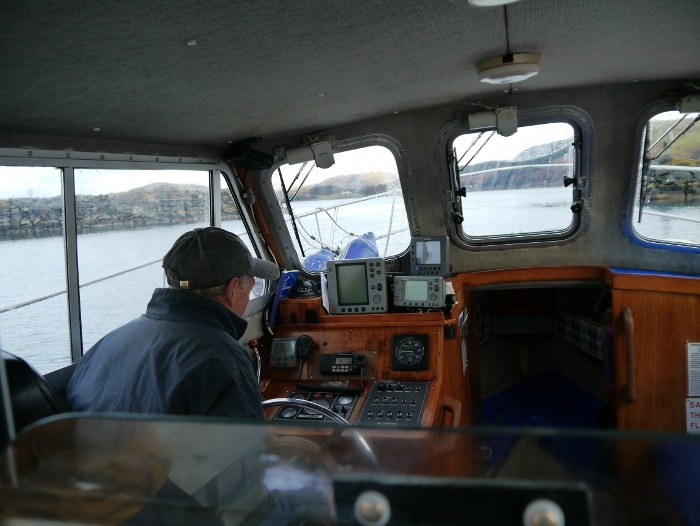 Our skipper of the Farsain was Duncan Philips who Pete has used on several occasions now to get to Jura and a previous trip to Scarba. We were definitely in capable and experienced hands. 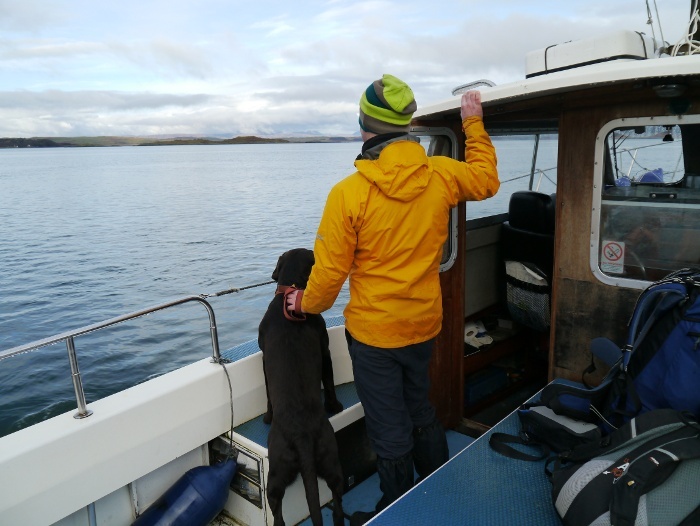 It was great to stand on the open deck and feel the sea breeze on my face as we motored along the southern coasts of Shuna and Luing. 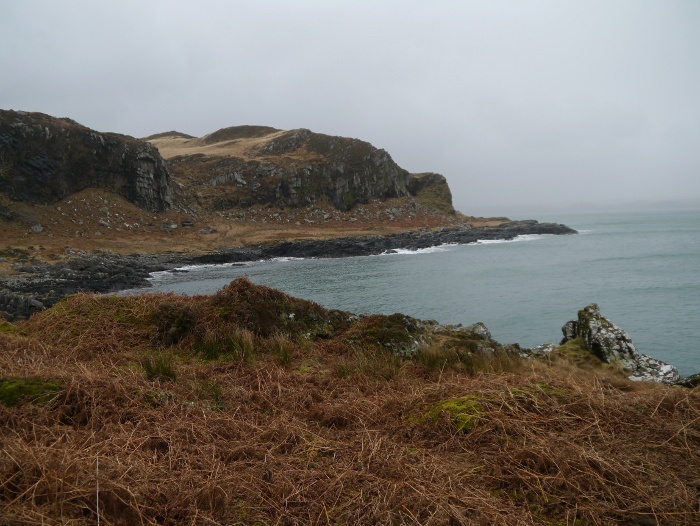 The sea was glassy smooth and it was a relaxing half hour or so until we reached the eastern coast of Scarba. 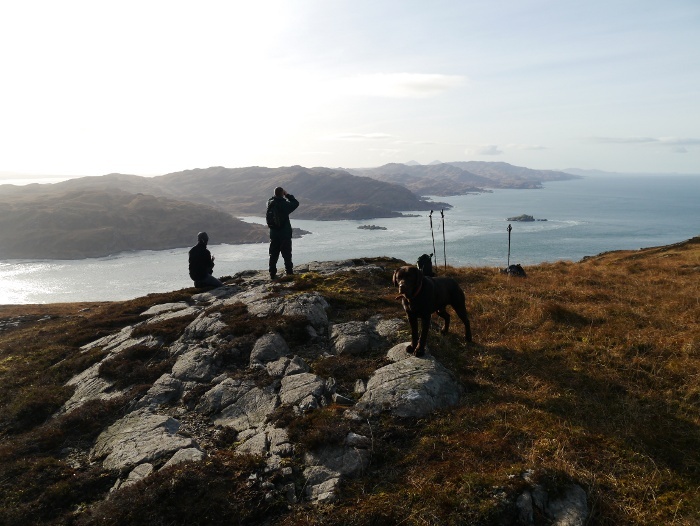 Duncan had a treat in store, showing us where a pair of white tailed sea eagles were nesting, unfortunately they did not grace us with their presence. 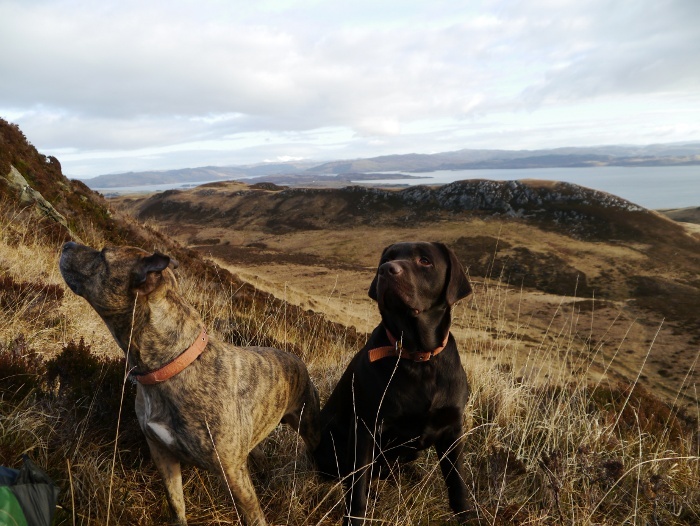 An unexpected bonus was a trip through the Grey Dogs tidal race between Scarba and Lunga. Here the sea rushes through a narrow channel, Duncan saying that it was running at eight and a half knots. It was great fun watching him wrestle a small boat through the turbulent waters, spinning the wheel madly. The light was in the wrong direction and photos never really show things to the full effect so this was the best I could come up with. However the look on Pete’s face pretty much summed up how we all felt. The tide was low when we arrived at the jetty on Scarba to unload our rather large and heavy rucksacks and the dogs. The only way to get to the island is either under your own steam (i.e. kayak) or by chartering a boat, there is no public ferry. The Farsain will take you for £60 each way which is an absolute bargain considering that Duncan has to do the crossing twice for this. With four of us it was £30 each for a round trip. Contact Farsain Cruises on 07880 714165. I have to say that it was a fantastic feeling when Duncan sailed away with plans to return for us three days later. 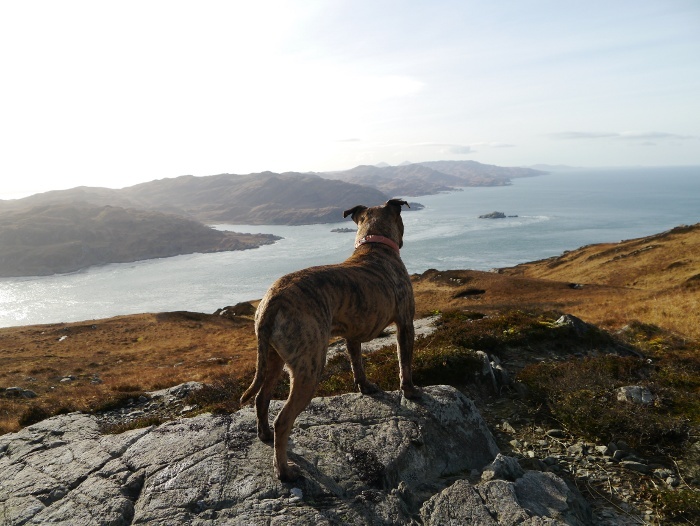 With our sole mode of transport disappearing over the horizon, Scarba suddenly felt very remote. 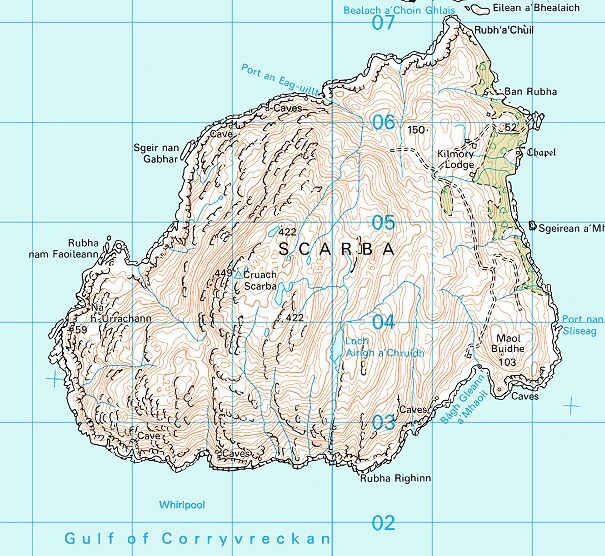 Geographically the island appears as a single mountain rising out of the sea. 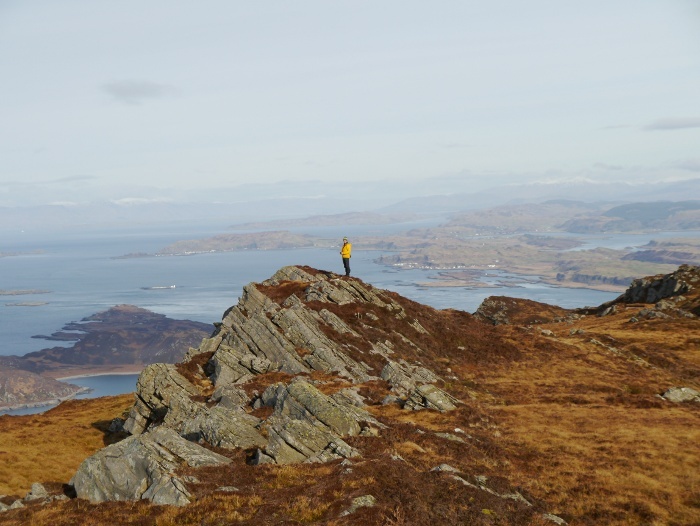 The high point is Cruach Scarba at 449 metres, a substantial hill when rising steeply from sea level. 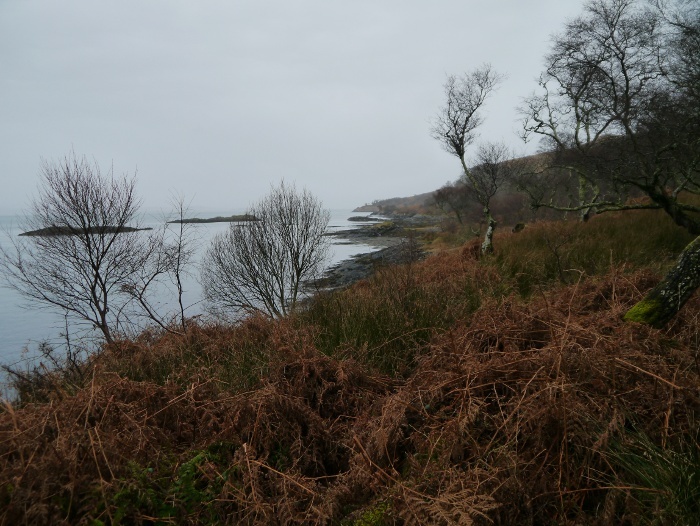 The south and west coast is wild and rocky whilst the east is much more gentle with patches of woodland. Overall its a rugged little island. 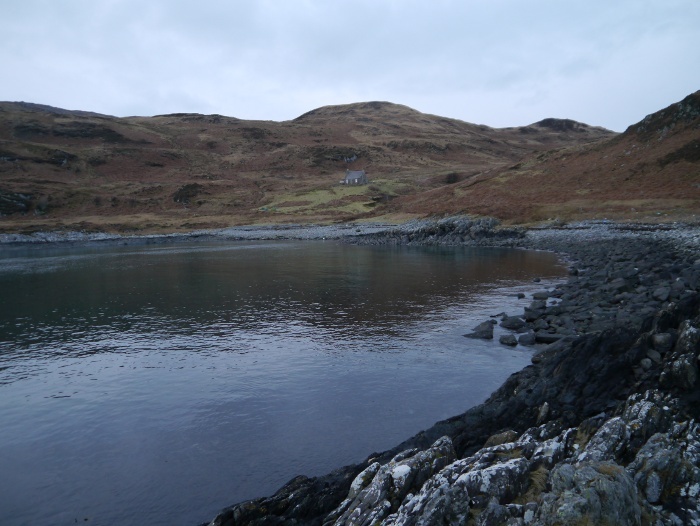 From the jetty it was a steep climb up a track to Kilmory lodge, mostly used by stalking parties. We were glad that we were not met by a welcoming party as we passed its white washed walls. This was not a lightweight expedition and we were all carrying as many luxuries as possible, including large volumes of food and some alcohol. My legs were groaning under the weight by the time we reached the highest section of track. The view to the east towards the mainland more than made up for this though. A steady downhill and we were at the head of Gleann a’ Mhaoil, the bothy that would be our base for the next three nights coming into view. The bothy door, which had seen better days was closed with a complicated system of ropes connected to a nearby fence post. Either the wind gets really strong or the sheep are very keen to seek shelter. We finally gained entry to have a good look around inside. Although a sturdy building with a solid roof it is not particularly inviting inside. 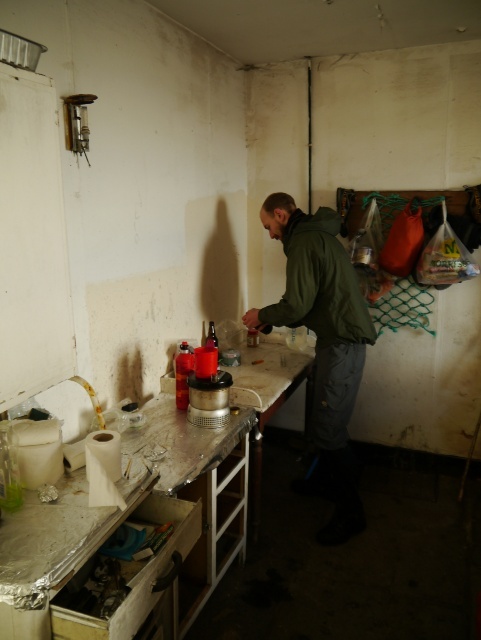 Its last use was as an outward bounds centre and it had the feeling of the Mary Celeste about it. 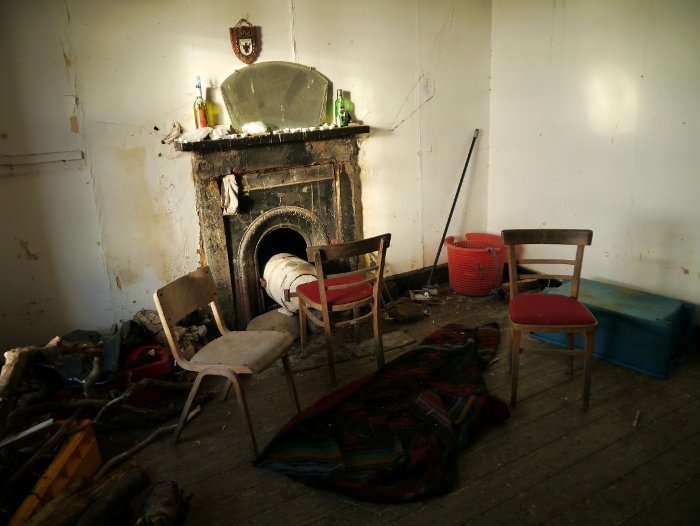 More abandoned dwelling than bona fide bothy. After turning our noses up at the rooms upstairs we all decided to camp outside so set off down the steep slopes in front of the bothy in search of a pitch. The short-cropped grass was still at a bit of a jaunty angle but we all managed to get reasonable pitches. However it was the location that was a winner, being a few short metres from the shore. A coastal camp beats a mountain camp in my book. A quick scout around the immediate coast resulted in piles of driftwood being dragged back to the bothy. With the island being relatively infrequently visited there was very rich pickings to be had. 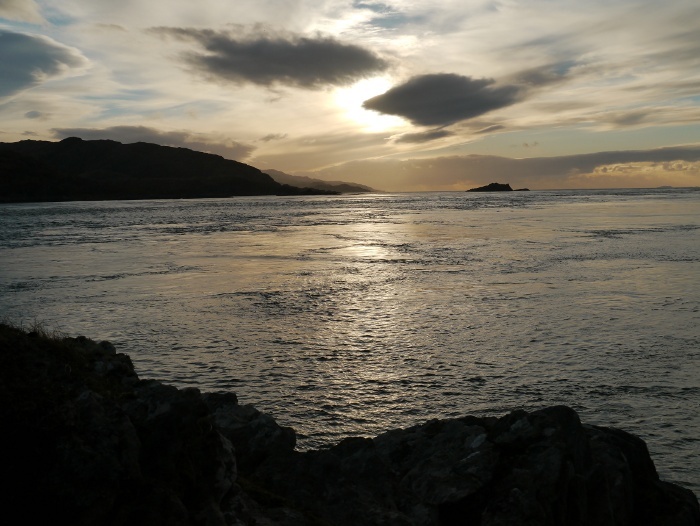 After a spot of lunch we all decided to make the most of the fine weather and headed off along the south coast to see how far we could get towards the Corryvreckan whirlpool. 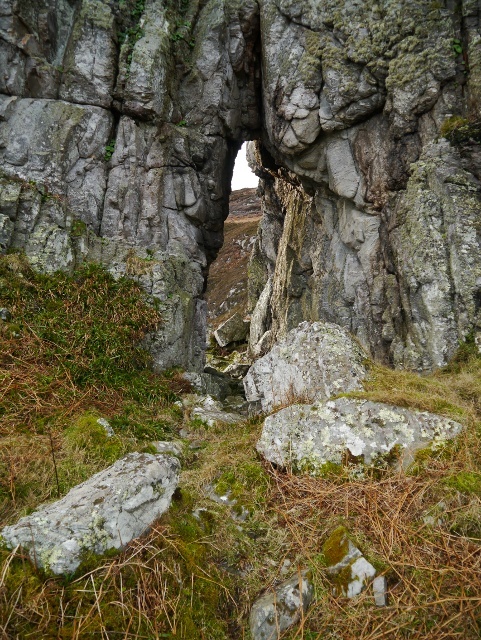 It was a fine scenic wander full of geographical wonders, the first of which was an arch in the cliffs. 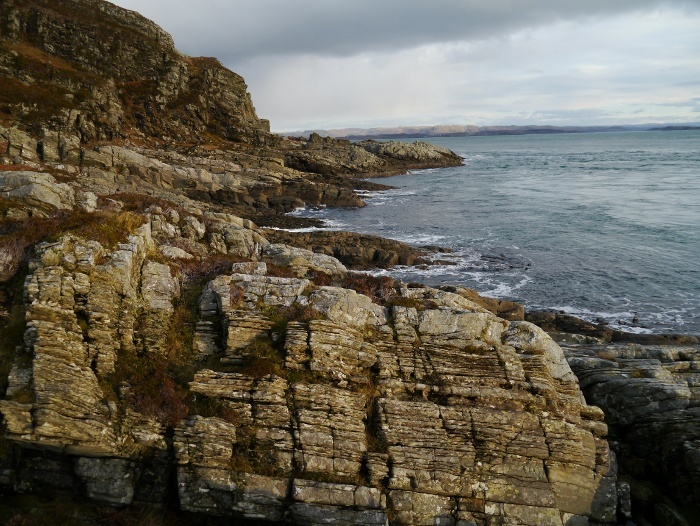 The landscape was very reminiscent of the West Coast of Jura which is located a few short kilometres away. 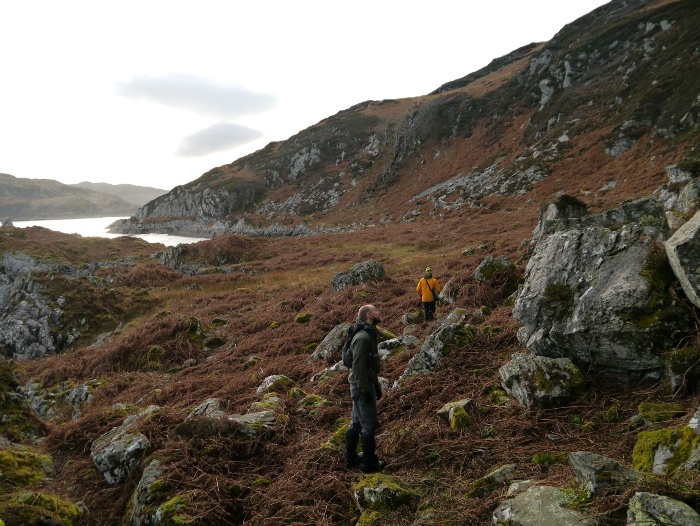 Wide boggy wanders were interspersed with some rocky scrambling, some of which was a bit of a challenge for Reuben. Staffies are not renowned for their rock climbing abilities. 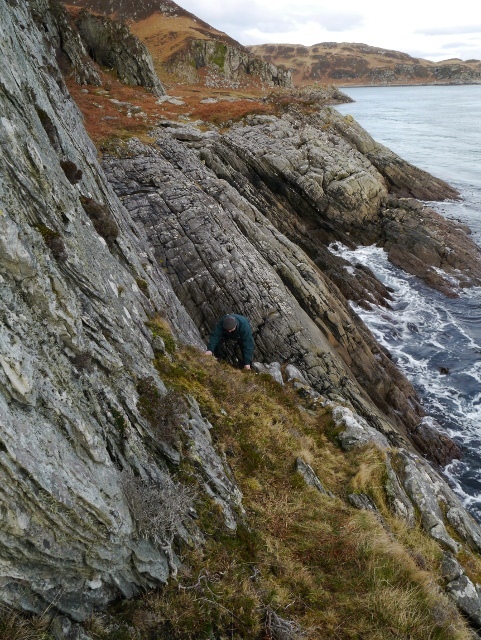 One of the more challenging sections involved a rocky scramble followed by a narrow ledge above the sea. Not too bad in the dry but I would imagine that it would be much harder when wet. After an hour or so I was absolutely knackered, the last couple of days of driving had caught up with me. 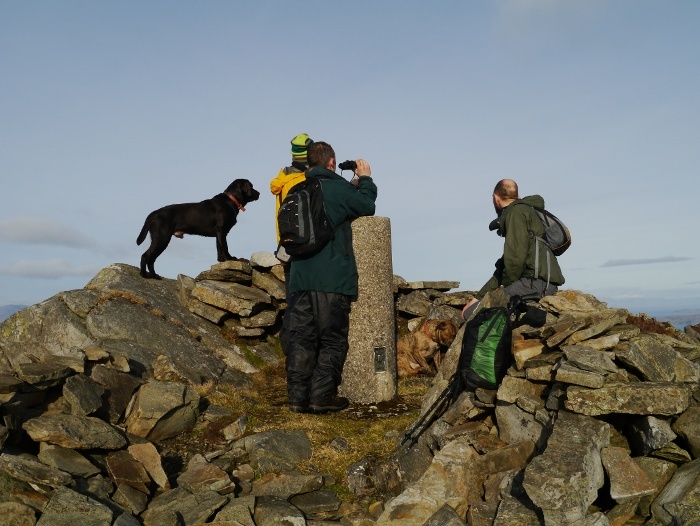 We had reached a high point and to continue involved a steep descent followed by re-ascent. I really could not be arsed! As the others continued I retraced my steps along a high narrow ledge. There was a horrible stomach churning moment when Reuben who was in front of me disappeared over the edge. He had walked though an overhanging section of heather, mistaking it for solid ground. Thankfully there was a small ledge below and I spent a frantic few seconds climbing down to retrieve him. Back on terra firma I found some rocks to sit on and enjoyed being still for a while, a truly wonderful spot. My reverie was soon shattered by thirty five kilos of labrador bounding down the slopes towards me. One thing that I learnt this weekend is that you need to side step when Dougal runs up to greet you. One day Reuben failed to do this and was knocked from all four paws. 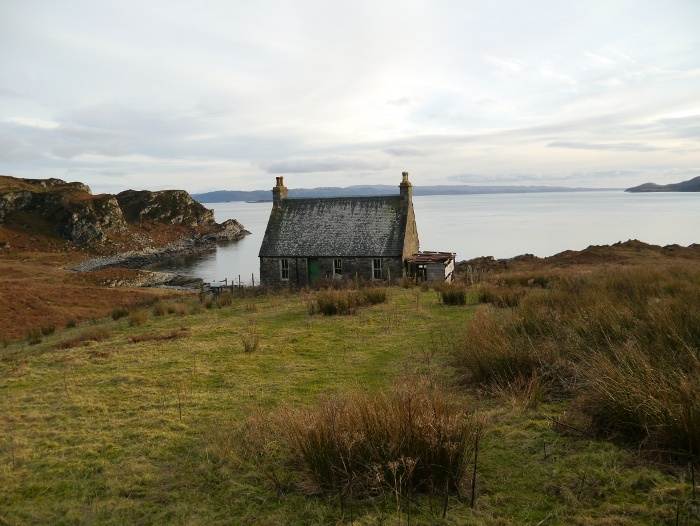 The others had only gone a short distance along the coast before retreating, so as to get back to the bothy before darkness fell. 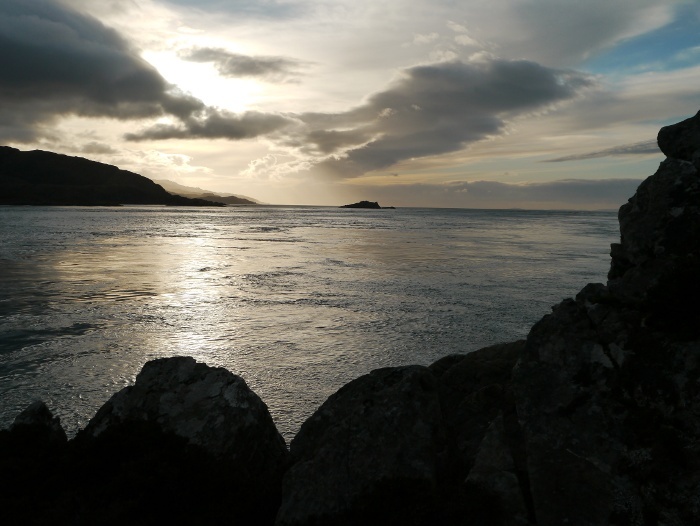 The fading Hebridean light was rather special. 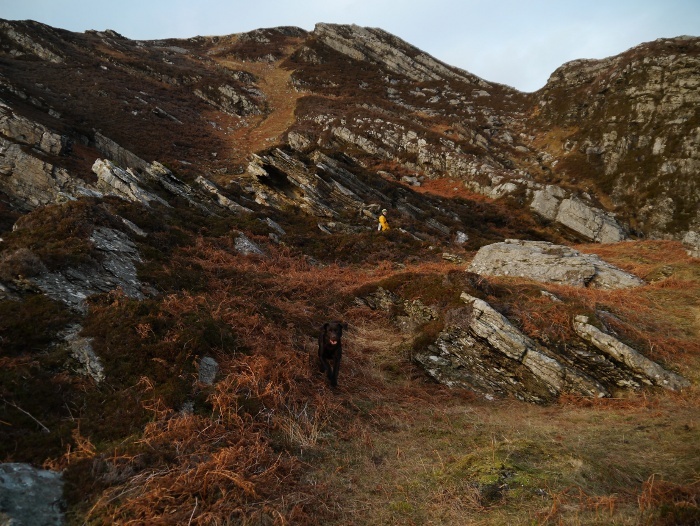 We retraced our steps, Reuben having a little panic on one of the rocky scrambles. After that I decided to avoid anything too challenging with him as an accident could have tragic consequences being so far from help. A football washed ashore provided a fun diversion for both of the dogs. 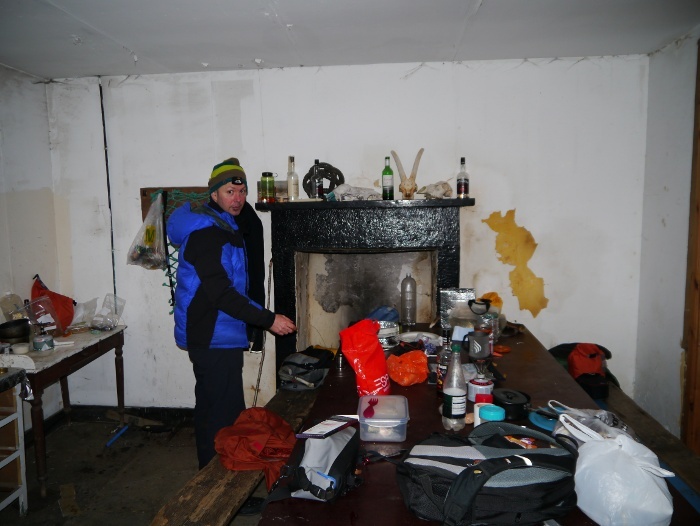 Although we had camped, the bothy was still our main base for the weekend. Somewhere where we could socialise, cook and warm ourselves around the fire. The kitchen table accommodated us so we could all cook at the same time, somewhere to sit and work our way through the mountains of food that we had lugged across from the mainland. One of my top bothy tips is to take along a pair of old slippers. There is no better feeling that removing wet footwear (inevitable on the west coast) and padding around like Noel Coward. The dressing gown was left at home though. The fire was soon roaring giving us the aroma of wood smoke as initially much of it failed to go up the chimney. 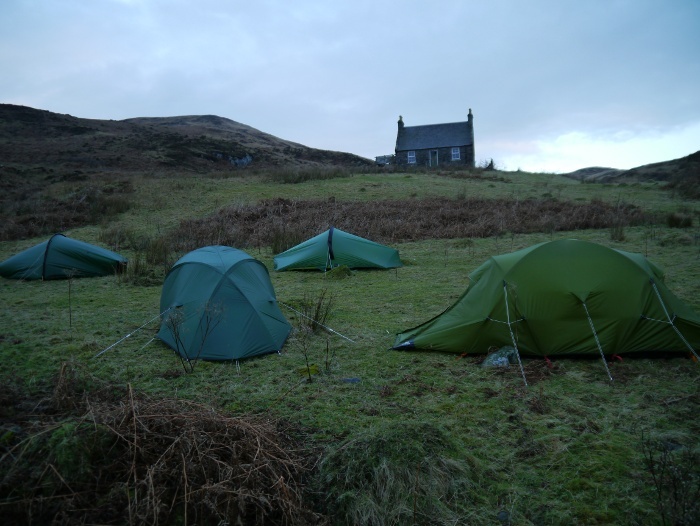 An enjoyable bothy evening followed, although being a stag weekend we were all tucked up in our tents by 9.00pm. It was a surprisingly cold night and I was woken rather brutally by Dougal doing a belly flop on the front of the tent in his effort to come and say hello to Reuben. Thankfully I was in a sturdy Voyager rather than a lightweight silnylon number. There was frost on the grass when I got up, probably unusual on the west coast. Being early February, dawn was late coming and the sun had yet to rise above the horizon. A perfect winters morning in the Hebrides. With everyone up and about early we all spent a couple of hours around the bothy, taking photos and enjoying the environment. 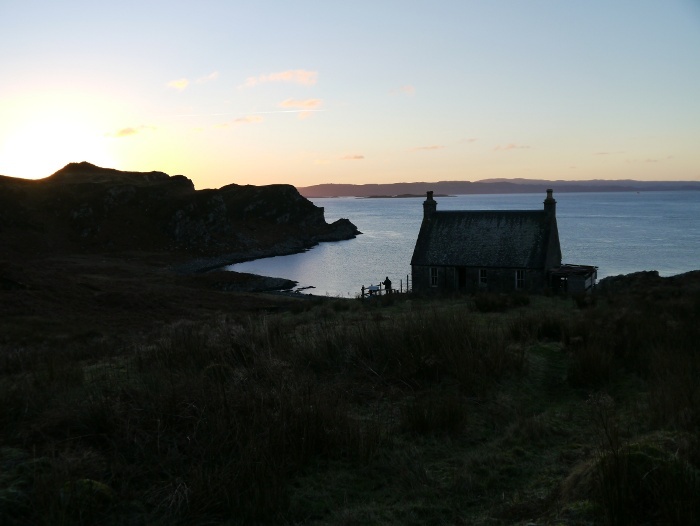 I took the opportunity to take a few of the bothy itself inbetween numerous cups of coffee. Not exactly a palace but it soon began to feel familiar. It was nice knowing that we would almost certainly be having it all to ourselves for the weekend, other visitors being highly unlikely. With the sun shining we all had our day sacks quickly packed, it was time to explore some more of treasure island. You would have thought that by getting as far away as possible from civilisation the more unspoilt the environment would be. Sadly along our coastal waters this is not the case. 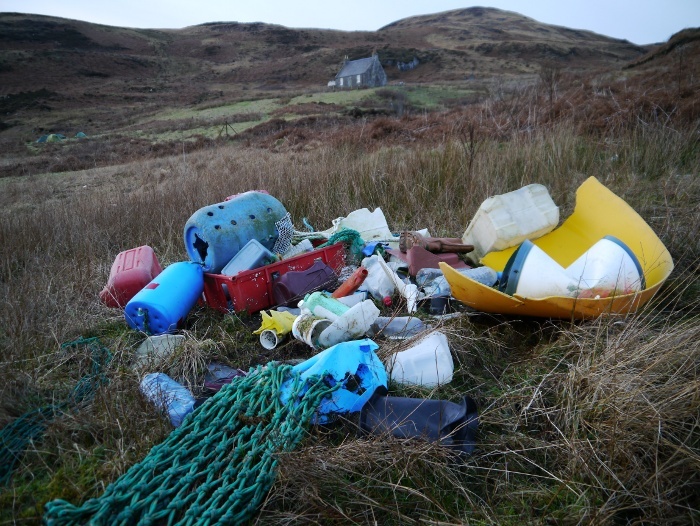 On a trip to the remote west coast of Jura late last year the entire coastline was covered in plastic and general crap. This consisted anything from fishing crates, plastic bottles, flip-flops, shoes, old rope, more plastic bottles. Basically if it floats there is a good chance of it turning up on a beach. Sadly this was the same on Scarba, how the hell does all this end up in the sea? On the plus side Reuben found a couple of dead footballs to play with.